Buy Classification Folders That Are Exactly What You Need! How do I find the right classification folders for my office? This is a question we hear often, because of all the file folders we sell, classification folders are the most complicated and difficult to purchase. This quick guide tells you all you need to know to quickly and confidently order the right folder every time. Unlike standard file folders or hanging folders where you only need to worry about the size, color and what tab cut you want, classification folders have many different variables to consider. Today, buying office supplies online is now the preferred way to order office products, and you need a step-by-step guide to ensure you find the exact item for your needs. Classification folders like this one from Universal have many different features to consider. Select Your Size – First you should sort by size. Classification folders come in letter size which holds standard 8.5 x 11 papers, and legal size holds 8.5 x 14 papers. Make sure you order the size you need! You’d be surprised how many people order the wrong size. 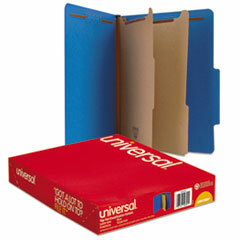 4 Section Folders – These have 1 divider in the middle of the folder. 6 Section Folders – These have 2 dividers and are the most popular style. 8 Section Folders – These have 3 dividers. 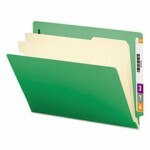 Select Your Color – Classification folders come in a variety of colors. These include the old stand-by manila as well as top selling colors red, blue, green, gray and yellow. Most people by multiple colors so they can color code their filing system, which we highly recommend for efficiency. Select Your Tab – Like sections, this is where many people get confused and order the wrong item. There are two basic choices. Top Tab file folders are the most popular style. Like most standard file folders, they have the tab of the folder, where you write or place a label, on the long horizontal side of the folder or “on top”. End Tab classification folders have the tab on the short side, or vertical side of the folder, on the end. These are used for most doctor and dentist office filing systems where labels are secured on the end tabs for filing things alphabetically or by date. This Smead end tab classification folder shows the positioning of the tab for labeling. Once you’ve sorted by size, section, color and tab, all that’s left is selecting the brand you prefer and the price you want to pay. We recommend two brands – Smead for their breadth of line and quality, and Universal classification folders for their great price and value. In fact, Universal is our top selling line of folders because the pricing is really low, and the quality is on par with the national brands. That’s it! Some last details to make you an expert. Most quality classification folders are made using pressboard material which is what you should look for. That makes the folder more durable and long lasting. Standard weights for pressboard today are between 23 – 25 point, but 15 point is sometimes used for manila folders. Classification folders have two additional special features: 2” fasteners at the top of each section which hold two-hole punched papers, and the bottom gussets are expandable by 2” to hold tons of pages. Now you can buy classification folders with confidence, and buying office supplies online with Zuma gets you your order in 1-2 business days while knowing you are buying from an independent company who give back to the community. Like what you’ve learned or have questions? Let us know. This entry was posted in Classification Folders, Office Supplies and tagged Classification Folders, hanging folders, Office Supplies Online, Smead classification folders, zumaoffice.com. Bookmark the permalink.